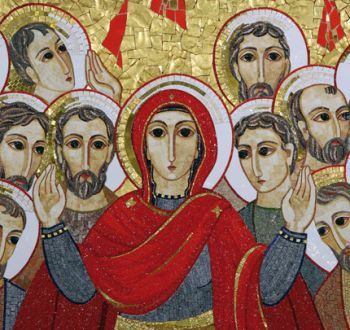 "Mary and the holy women were with the Apostles begging in the most earnest and unceasing prayer for the full outpouring of the Holy Spirit. Our Lady asked this first for herself, because, holy as she was, she wanted to be holier still and to earn a more perfect fullness of the Holy Spirit who already reigned in her. She prayed for herself, but she prayed even more for us. At the foot of the cross she became mother of all people, she asked that they might be enriched with the immense treasure that is the fullness of the Holy Ghost. We are daughters of the Assumption, and so we ought to rise gladly from earth to heaven in the wake of our glorious Mother Mary. Why then do earthly things so often make us glad or sorry? Alas, it is because we do not let the Holy Spirit set us on fire and inebriate us enough. We weep sometimes for trifles, or if we are too grown up to shed tears we become sad and worried and cast down, instead of giving ourselves up to the Holy Spirit of God and letting Him lift us above such miseries. I have said that the Holy Spirit inebriates us. I must add that he strengthens us. Look at the Apostles, so timid and frightened that they abandoned their master, denied him at the word of a servant. But after Pentecost Sunday they are strong! They go before the magistrates and are not afraid to say: ‘Judge for yourselves, whether it would be right for us in the sight of God to listen to your voice instead of God’s.’ [Acts 4:19] They divide the world up among themselves, they face all dangers, and die martyrs confessing their allegiance to Christ Our Lord. Why then are we so weak, we who have received the Holy Spirit? Why are so few people strong in the face of humiliation, suffering and the inner and outward trials of life, when all the time the Holy Spirit lives in us? “You are God’s temples and God’s Spirit has his temple in you.” [1 Corinthians 3:16] We are temples of the Holy Spirit, the Spirit of strength, the Spirit of Prayer, the Spirit of Love. But we are weak because we do not have recourse to our divine guest. We are too absorbed by the things we see. We do not live enough with him, nor do we let him rule over us enough to be our master. Finally, the Holy Spirit raises us up, lifts our souls to higher things. Consult your own experience. How easy it is to pray when one is carried on the wings of the Holy Spirit! Have you not felt on certain blessed days that He carried you upwards and that by him your soul was able to raise higher and higher? To rise is truly in keeping with the spirit of the Assumption, and by the light and love from above, by the warmth and strength of the Holy Spirit, we can rise aloft in spite of all our weakness. During this Easter-tide, we have heard St. Paul say, “Rise, then, with Christ, you must lift your thoughts above, where Christ now sits at the right hand of God. You must be heavenly minded, not earthly minded.” [Colossians 3:1-2] Christ has risen, and we have sung the heavenly cry of joy, “Alleluia!” We must let ourselves be lifted up and we must offer to God the Holy Spirit Our Lady’s prayer that she said in the cenacle for herself, and still more for us. For the Apostles she obtained the grace of being no longer of the earth, earthly. We must beg for that same grace for ourselves, and not let this season pass without producing its fruits in us."